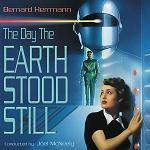 The Day the Earth Stood Still is a landmark film in many ways. Although Science Fiction stories had been around for a while and there had already been a number of such films, this film managed to avoid the somewhat trashy image of previous movies and portrayed its subject matter seriously. As a result it sparked a new interest in this genre, perhaps contributing to the position today where many sci-fi films have achieved high places on box office hit lists. It is not about monsters and alien invasions but poses questions about how humanity might react to friendly yet technologically superior visitors from space preaching an anti-war message. The story-telling might be a little sober but the believable plot and characters, and most of all the impressive visuals led to the film achieving a cult status. Most people are familiar with the image of Michael Rennie as the alien Klaatu in his shiny suit, his "flying saucer" spaceship, Gort his robot and the instruction "Klaatu barada nikto" which has now achieved the status of a cult catchphrase. In the music department, the film was also influential. Composer Bernard Herrmann was an established composer and conductor with serious credentials. This was before his Alfred Hitchcock days, but he had already scored "Citizen Kane" and "The Magnificent Ambersons" for Orson Wells among several other notable films. There are two main reasons for the music's influence. Firstly there is the composer's characteristic intensity, resulting from the way he employs short musical fragments and uses these building bricks to construct a powerful, atmospheric score. (The programme notes on this recording by Herrmann expert Christopher Husted note several examples of symmetrical forms and patterns used in the music's construction.) Secondly Herrmann, who is well-known for the careful way he selects his instrumentation, on this occasion chose to add the Theremin to that sound palette. He was certainly not the first to use this electronic instrument in a film (indeed Dimitri Tiomkin had done so the previous year on the film "The Thing from Another World"), but Herrmann's usage went beyond mere sound effect. Where used the instrument plays a vital role, its unusual tones bringing it to the fore as a solo instrument. The conviction of its use made this the instrument of choice of science fiction composers for many years to come. The Theremin is a very difficult instrument to play well. It consists of a pair of metal antennae, and the player moves their hands through the electric field surrounding these antennae. This alters the shape of the field which is detected and turned into a sound. The main difficulty seems to be in controlling the pitch of the music, and on this Varese Sarabande re-recording Celia Sheen does a marvellous job of controlling this unruly instrument. The resulting music is clearer than on the original soundtrack and can be thoroughly recommended, the conductor Joel McNeely (an accomplished film composer in his own right) holding things together for an intimate yet eerie musical experience. As previously noted the programme notes help to put the film and its music into historical context and highlight some of the issues faced during the recording of this version. The CD can be found at these sites: Amazon.co.uk in the UK, or Amazon.com in the US.